You will be able to wager between $0.01 through to $0.25 per payline. You will also be able to wager up to ten coins per payline, which means that the maximum wager in this game is $45.00. You will also see features like autoplay, expert mode and game stats. There will be a very vibrant and colorful theme when you enter this online slot game. The background of this game is takes you to a dark alley way in the middle of the night, clothes are hanging from the their clothing lines to dry and you will see some lights for the people getting ready for the night. The graphics of this game are very crisp and detailed in every single way, the sound quality is more than perfect and the overall experience that you have while you are playing this game is more then incredible. 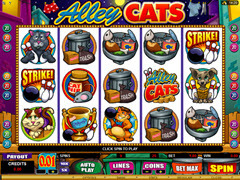 You will see slot symbols like several different female cats all looking for love, a golden trophy, a jar of cat nip, a garbage can, a angry looking dog, a gold cat holding a bowling ball, a male kitty, a wondrous kitten and so many others. There are three different in game features that will help you increase your bankroll. Each one will supply you will more than enough coins to keep you playing or for you to withdraw with. The first in game feature that you will notice is the scatter symbol. You will be able to land on the scatter symbols on any of the reels and these scatter symbols will include multipliers within them to. When you land on three of the symbols you get a multiplier of two, four symbols will give you a multiplier of ten and five of them will multiply your winnings by 100. The next special in game feature is the bonus game. You will need to land on three or more of these scatter symbols in order for the bonus game to be activated. When you activate the bonus game you have a chance to win a huge amount of money or twenty free spins. You will be sent to the back of the alley in this bonus round where you will be able to select three of six items. Each item will have a different prize behind it and each prize will give you a lot of extra cash. When you are awarded the free spins bonus you will be awarded twenty free spins with a 2x Multiplier. This in game feature cannot be re-triggered but that is only because you will only need to get this bonus once. When you land on these free spins bonus you will be able to win a huge amount of money. 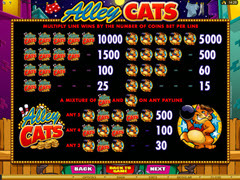 Overall we have found that Alley Cats is one of the coolest games you will ever play from the software developer Microgaming. We can ensure you that you will have the very best time while you are playing this slot game.